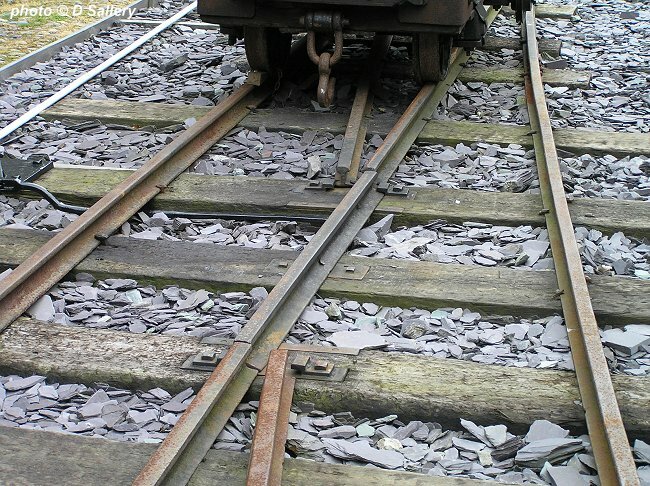 The narrow gauge tramways ran on many different types of track and some of these were unique to the industry, or even the individual quarry. 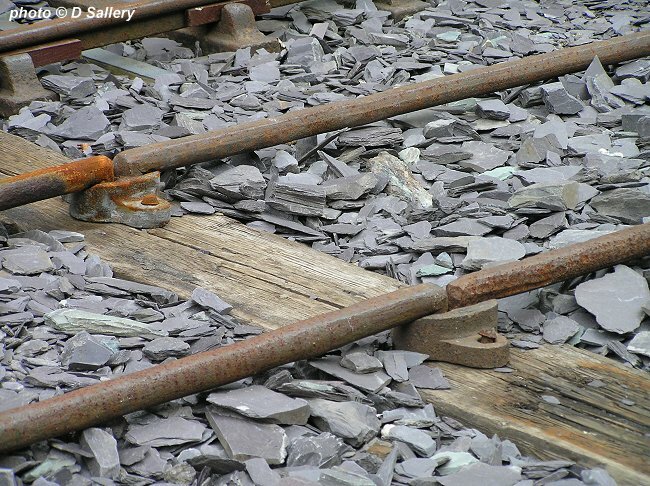 Trackwork in the quarries themselves and particularly in the working areas was often of indifferent quality but the ability to access working areas rapidly was considered of more importance. 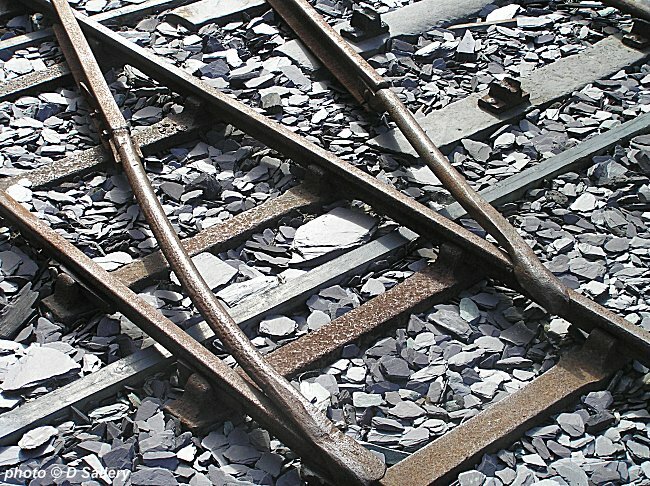 The use of temporary, easily movable track and pointwork was widespread and several ingenious designs were evolved. This type of tramway was only ever suitable for wagons, locomotives demanded a far higher standard of permanent way to operate on. The major difference from main line practice was the widespread use of wagons which had flanges on both sides of the wheel as opposed to a single flange on the inside. There was also widespread use of wheels which were loose on the axle rather than fixed allowing the wagon to cope with minor variations in the track gauge without derailing. 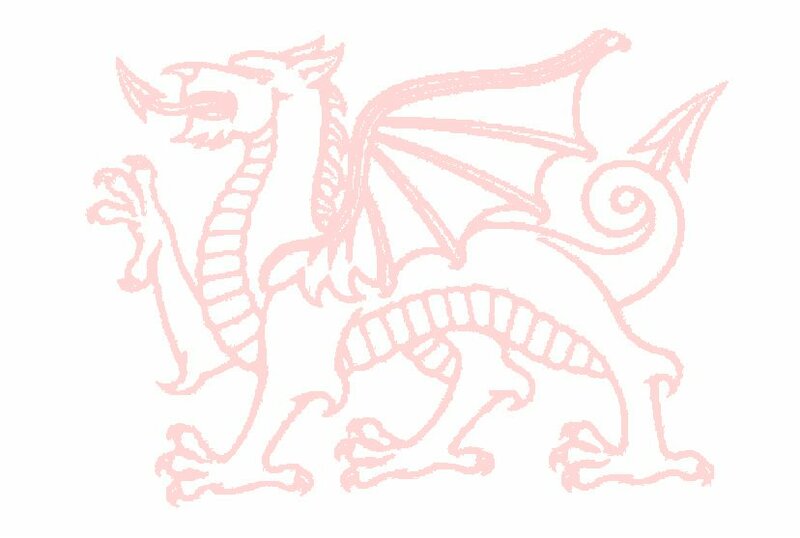 Double flanged wheels and variable axles were unsuitable for journeys of any great duration and, with the exception of the Penrhyn Railway which was laid out for double axle operation, all other locomotive worked lines of any length conformed to normal railway standards. 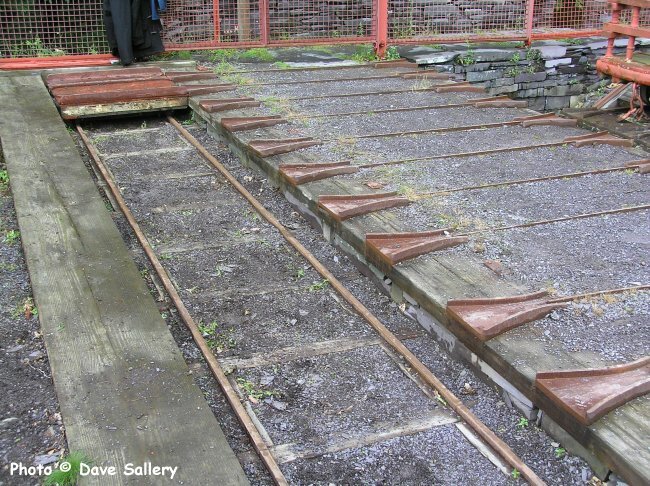 The Penrhyn Castle railway museum, near Bangor has an excellent display of quarry tracks and pointwork. This example of pointwork has no moving parts. Wagons were pushed from behind and 'encouraged' to go in the direction required. This type is known as a 'Spoon Point'. 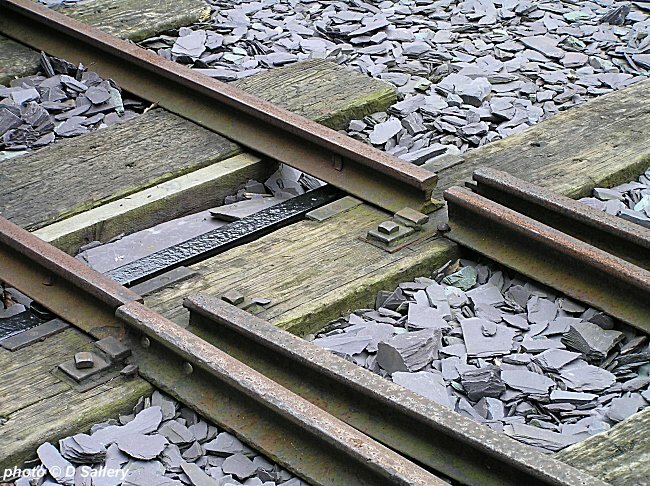 Access to the siding was obtained by lifting the two sections of hinged track to align with the main line - one fitted over each rail. 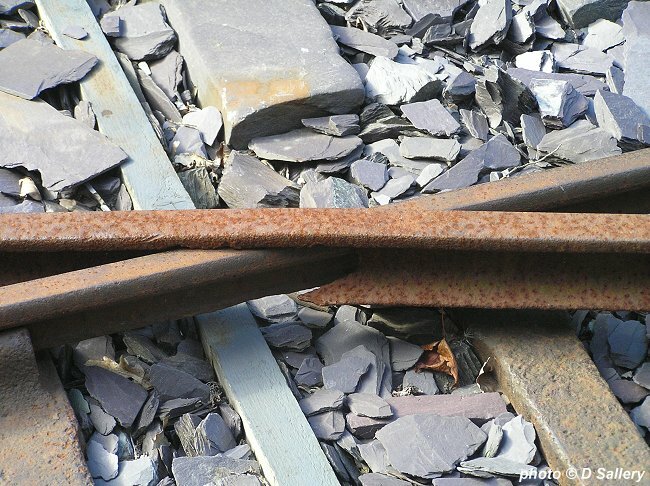 To gain access to the diverging track, the three metal strips known as pointers were realigned by hand. 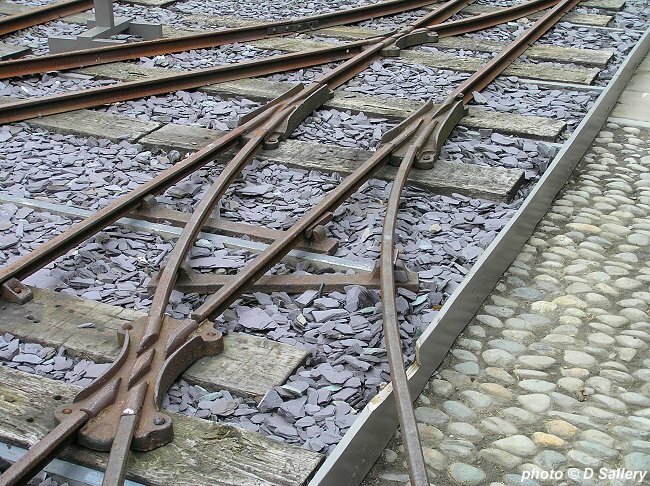 This is a main line turnout suitable for locomotives and double flanged wagons. It was worked remotely by using a point lever. 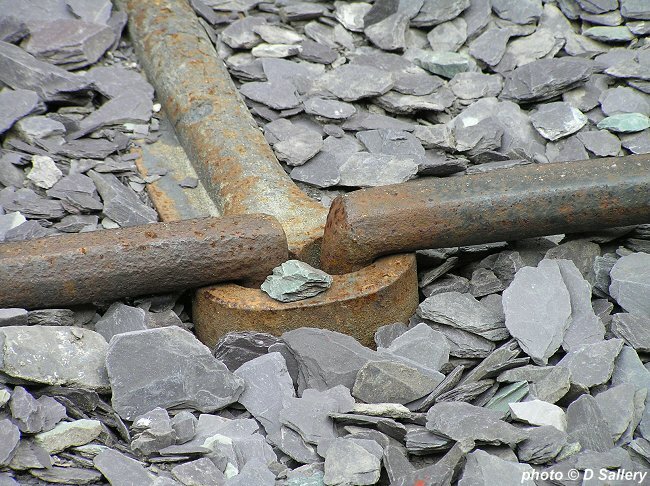 'Thomas Hughes rail' was invented by an engineer at Penrhyn Quarry. The rail consists of a round metal bar turned down at the ends which plugged into metal fixings. 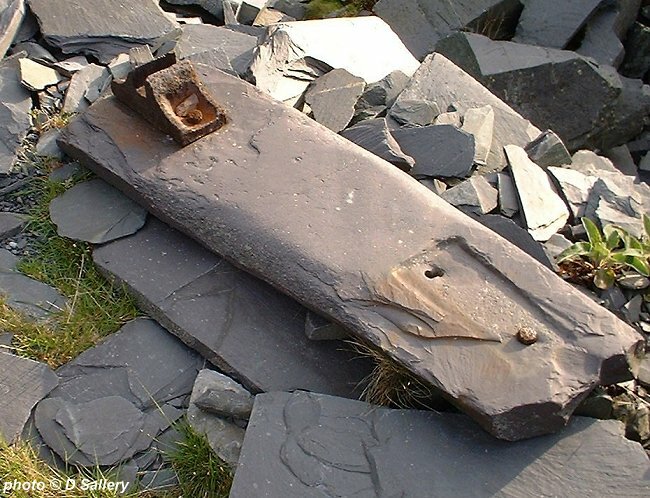 In some cases slabs of slate with drilled holes were used as sleepers. 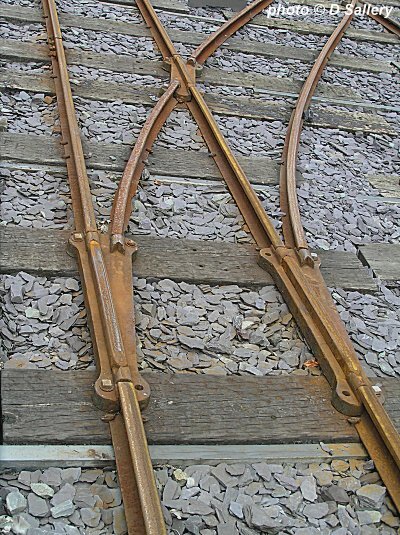 An example of a flat crossing designed for double flanged wagons. 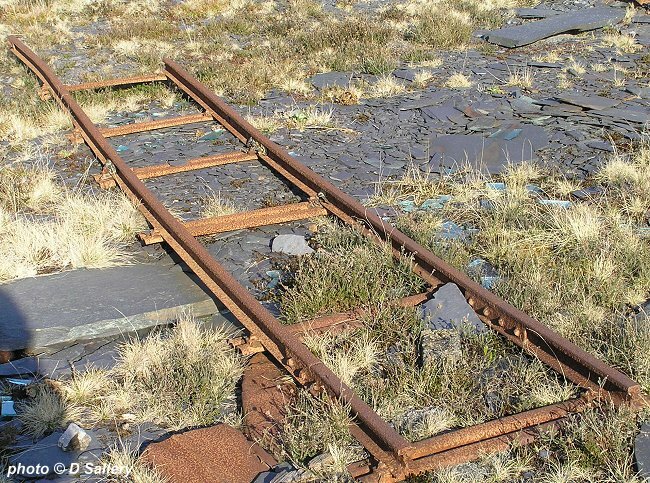 'Jubilee' trackwork was a steel prefabricated system which saw widespread use in quarries from the 1920's onwards. The point is designed for double flanged wheel use. 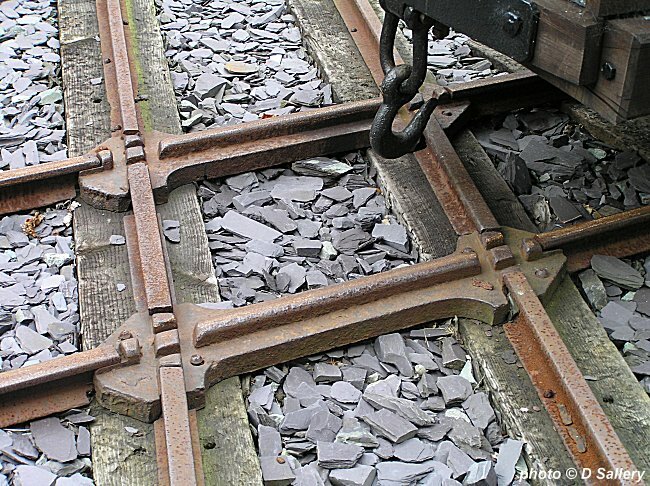 Slate sleepers were a common way of supporting lightly used tramways. 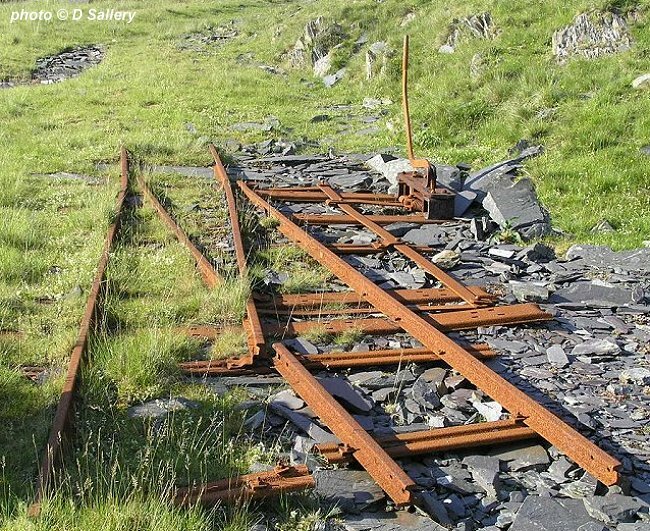 Tracks leading to a transfer table at the bottom of an incline. The lack of a continuous line of rails is not a big problem with double flanged wheels.